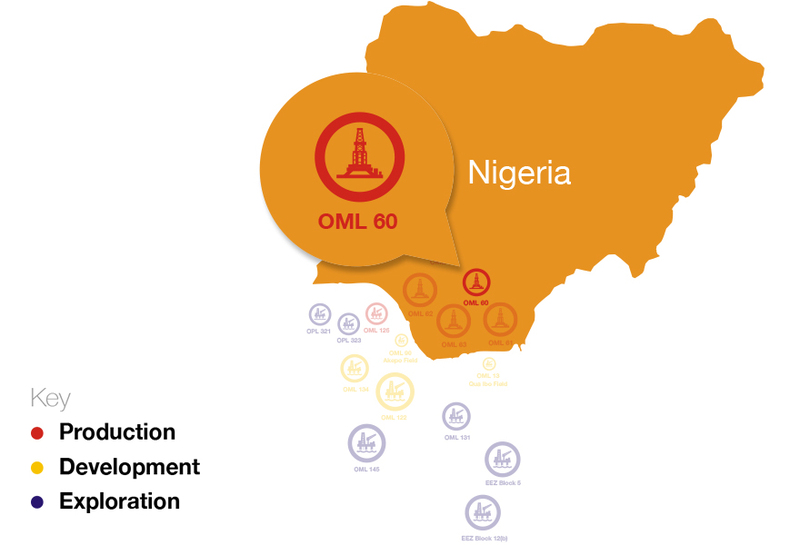 OML 60 is located onshore in the Northern Niger Delta. The licence covers an area of approximately 358 km² (88,464 acres). Oil and gas were first discovered within the License area in 1967 in the Akri Field and production started in 1972. Further discoveries were made between 1968 and 1974. To date, the License comprises seven producing fields and two singe well discoveries that have been produced in the past but are currently shut-in. All of the producing fields in OML 60 contain both light and medium sweet crude oil (typically 25° to 45° API), condensates and natural gas. Export pipelines, including a 10/14 inch line linking the Irri, Kwale and Akri fields with the Ebocha oil centre in OML 61, and a 24 inch gas line connecting the Kwale flowstation and Kwale gas plant to the Ob-Ob gas plant in OML 61.